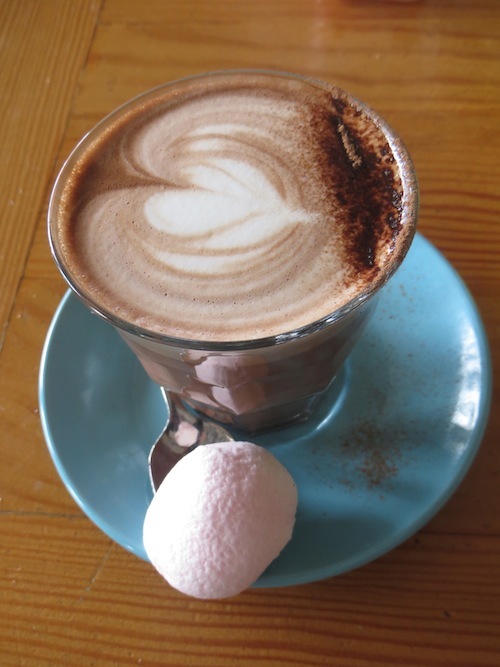 After several pretty bad hot chocolates along the road between Hobart and Launceston, I was beginning to wonder whether Australia’s talent for producing beautiful hot chocolates did not extend South to this state. That is until today. 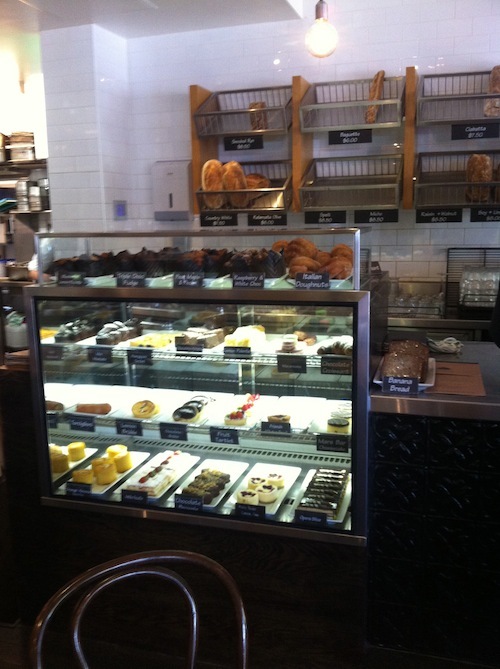 Cocobean Chocolate opened at 9am this Monday morning and we were there at 9:01 with high expectations. We were greeted by a very friendly young woman and when we asked her what hot chocolates they offered her face lit up and she got all excited. “Oh we have so many options, sit down and I’ll bring a menu”. We sat down right in the middle of a row of tables all facing the incredible display of chocolates, truffles, Easter eggs and chocolate bunnies. The place was already buzzing. To the far left of us was a woman there for her daily hot chocolate before going to work. A few moments later another woman arrived and sat at the table to the far right. They knew each other and spent several minutes speaking over us, sharing stories from the weekend. Two men in suits arrived to pick up a box with a giant chocolate bunny. 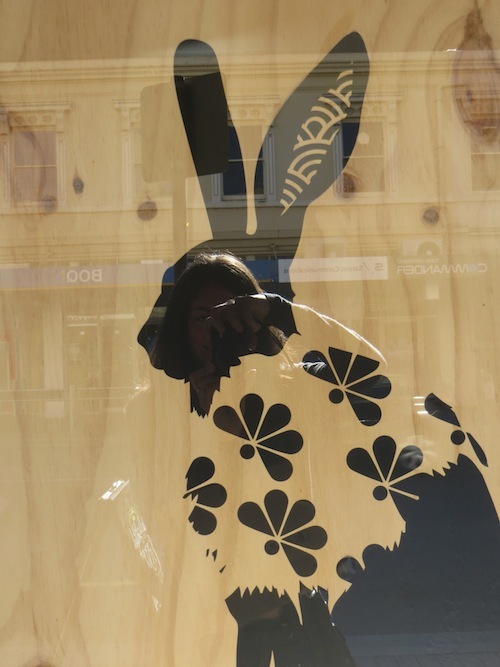 The bunny was to be displayed proudly at the front entrance of their business and there were plans to use it as a prize for a contest. 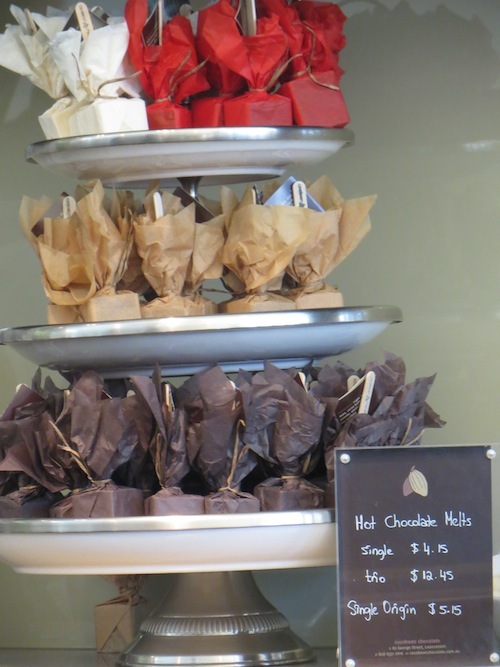 Cocobean Chocolates was founded in 2008 by Rick and Theresa Streefland. Theresa, who was in the store this morning, is a mum and connoisseur of all things quality and was looking to put her passion for food to good use after raising three kids. 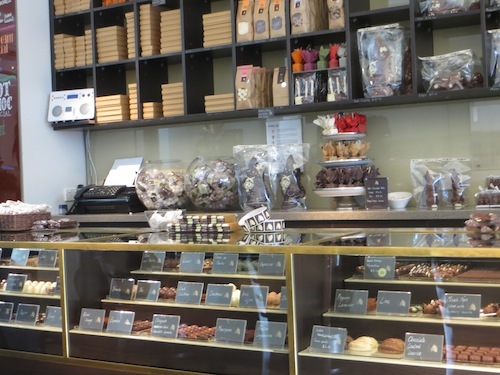 They started making the chocolates in the shop’s upstairs kitchen on George Street but quickly outgrew this facility and moved into a larger one. 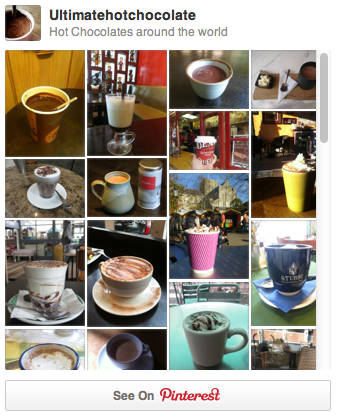 They had several hot chocolate offerings. 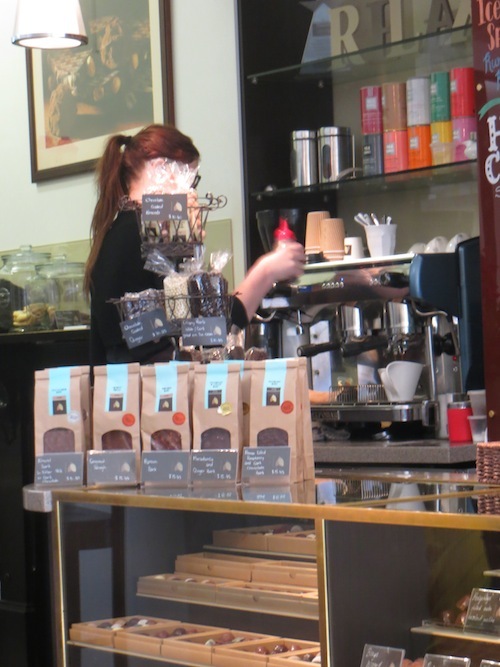 There was a classic hot chocolate which a steady stream of locals were coming in and ordering. You could also have a white hot chocolate and every week they had a special hot chocolate on offer which could be cinnamon, chili, vanilla bean, hazelnut, mixed spice, orange or caramel. 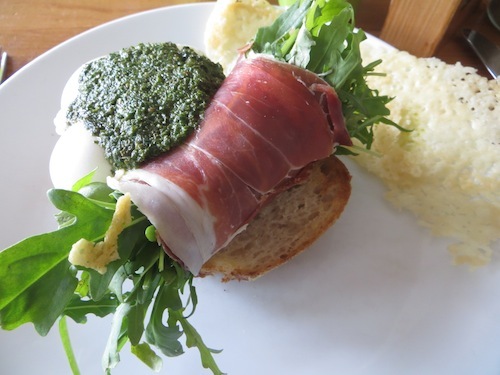 This week’s special was mint, another popular option for the locals coming in this morning. Cocobeans Chocolate also offers their hot chocolate in little individual packaged cubes of solid chocolate on sticks that you can melt into hot milk. I bought one with chili and tried it at home. It was beautiful. 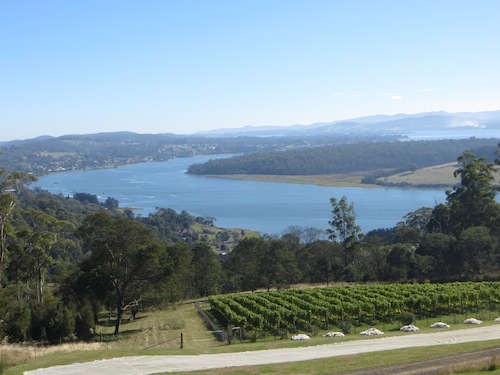 Our plan today was to drive the Tamar Wine Route and taste the very well known Tasmanian wines (red and sparkling in particular). 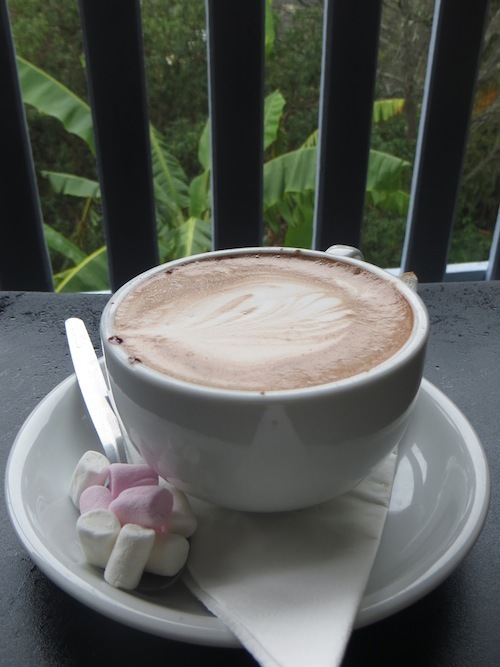 This hot chocolate must have been our lucky charm because for the first time in two weeks the clouds parted, the sun came out and we had perfect weather to visit the vineyards and enjoy the stunning views across the valley. Verdict: I loved everything about Cocobean. 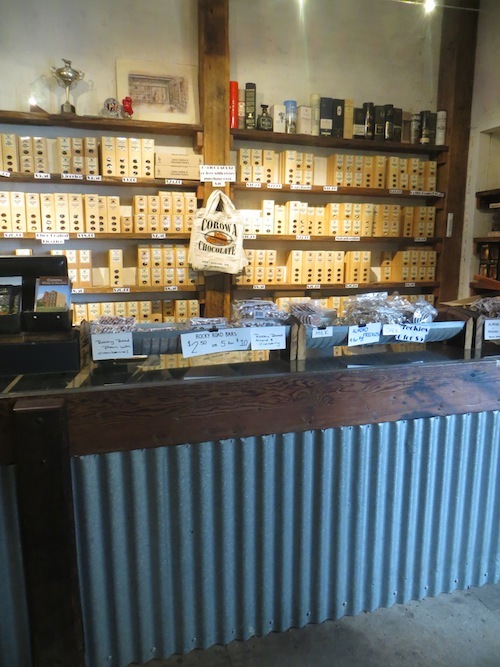 The staff were so friendly and they obviously have a lot of fans locally (and internationally), understandably! 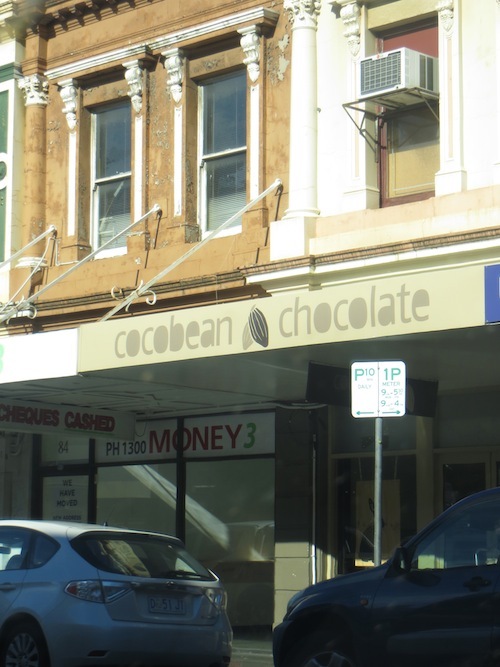 Cocobean Chocolate, 82 George Street, Launceston, Tasmania, Australia. 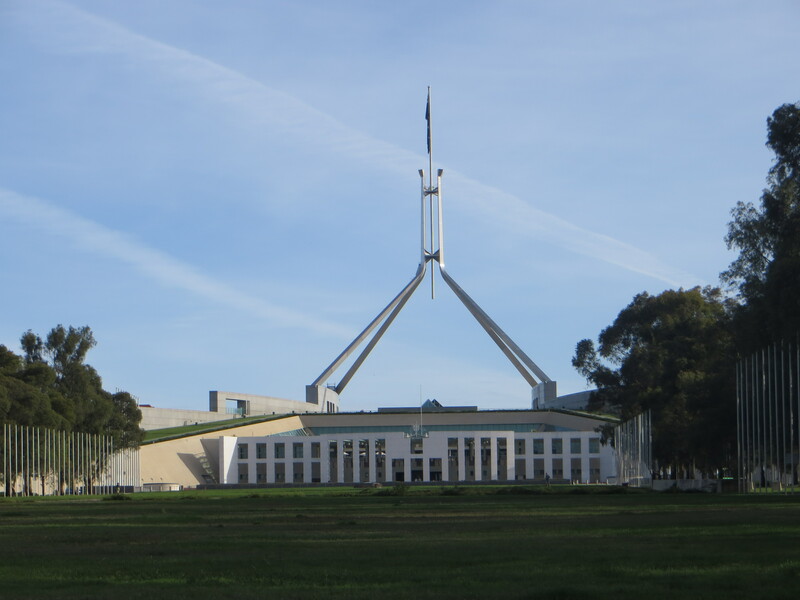 We only had two hours to explore Canberra on our drive back from Sydney towards Melbourne. Over the years I had heard many stories about the capital city, not very many of them complimentary. 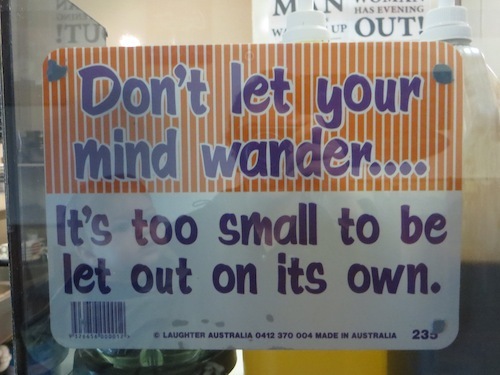 I remember reading a travel book where one author wrote that when he arrived in Canberra for the first time and couldn’t find anything exciting happening or anything interesting to see, he ended up going to the nearest pub and got drunk. So my expectations were not particularly high. 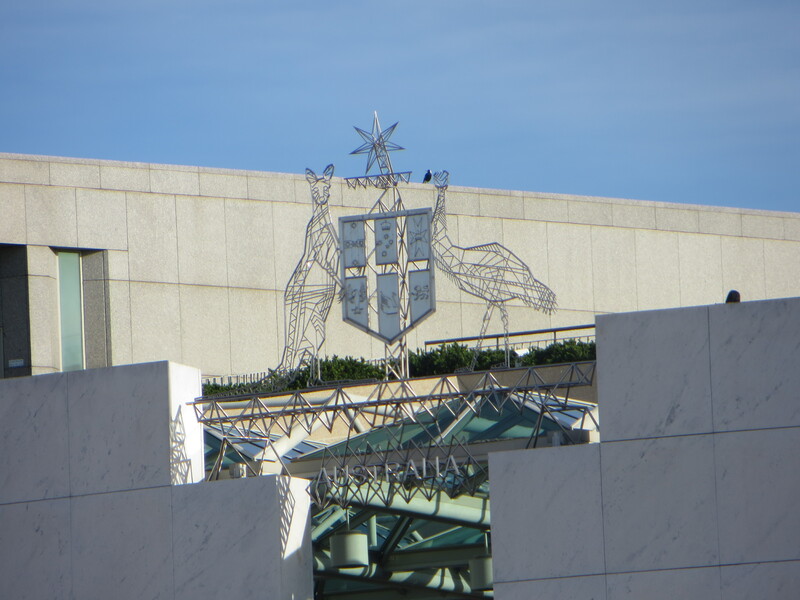 But he was wrong, Canberra was a very pretty city and at least today, everything was buzzing. 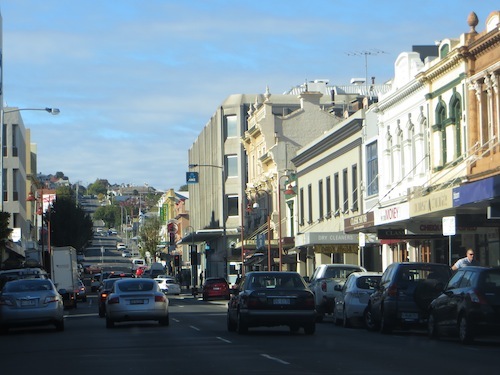 It isn’t at all dynamic, at least at first view, as Melbourne or Sydney. Instead it just has this little town feel, quiet and clean, with everything right where it is supposed to be. 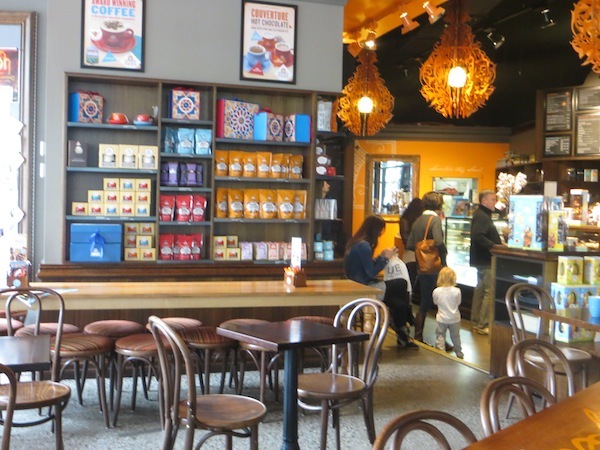 I wondered if that meant it would have good hot chocolates or dull hot chocolates, so I did a bit of research and the name Urban Pantry kept coming up as the place to go. And we weren’t the only ones. 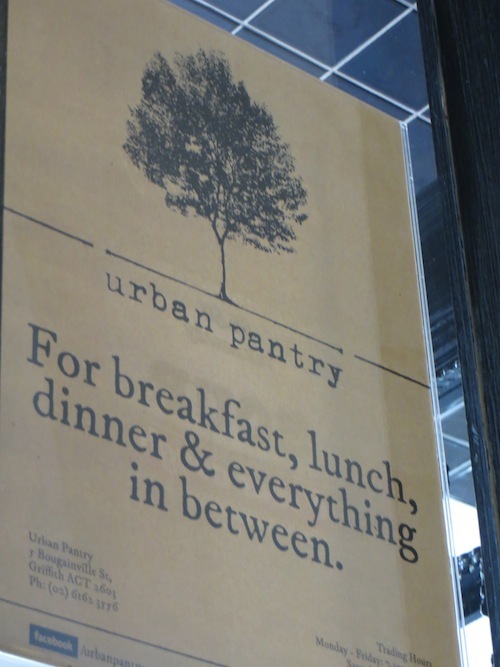 Urban Pantry was full today for lunch and everyone looked, like everything else in the city, very clean and serious and put together nicely. Most people were wearing suits and one by one as they went to the cash to pay they each had accents form different parts of the world; an American, then a Danish man, then a woman from Singapore. This spot is not far from the area which is filled with large embassy houses, each designed to look vaguely like a traditional house from that particular land. 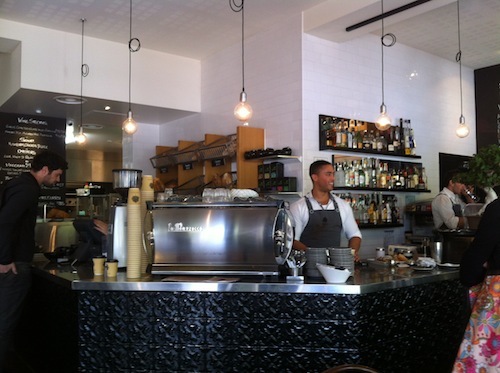 The inside was welcoming and takes its design cues from the neighbourhood’s leafy streets and heritage listed buildings. 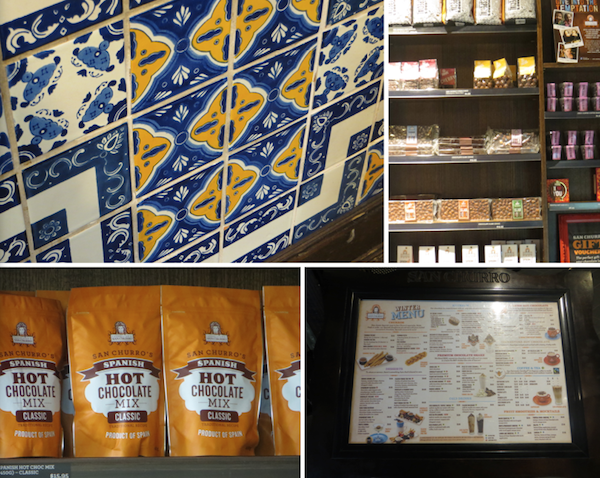 They had a wall covered in baskets full of freshly baked bread and lots of delicious looking sweets and a menu full of locally produced ingredients. Staff were friendly, although they seemed to be having more fun talking to each other than serving, which was from our table quite entertaining to watch. The menu lists not one but a whole list of hot chocolates; milk, dark, white or even chocolate overdose, all Belgian chocolate. You also had the option of having it in a cup or a mug, both with different price tags. We both ordered the dark chocolate in a mug. Now, many rave about this hot chocolate and I can see why, but today it just didn’t work with us. The mug that came was filled with hot milk which didn’t taste at all like chocolate. After a few sips we realized that they put actual chocolate at the bottom of the glass and that we had to mix it ourselves. Ordinarily I would love something like that, but in this case it was tricky because there just wasn’t any room in the mug to mix the chocolate properly. The chocolate used, which I ended up eating directly, tasted more like a milk chocolate than a dark chocolate…something in between the two. 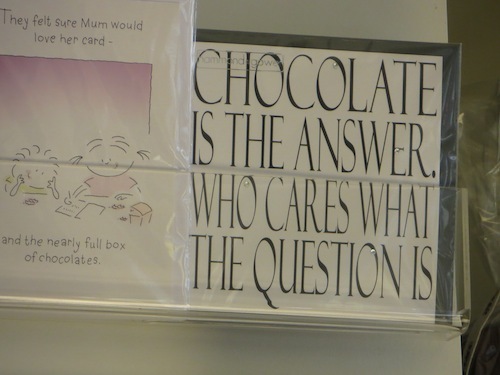 When we asked what kind of chocolate it was we were told it was Cadbury chocolate pieces (not so Belgian really). So I will keep mixed memories of Canberra. 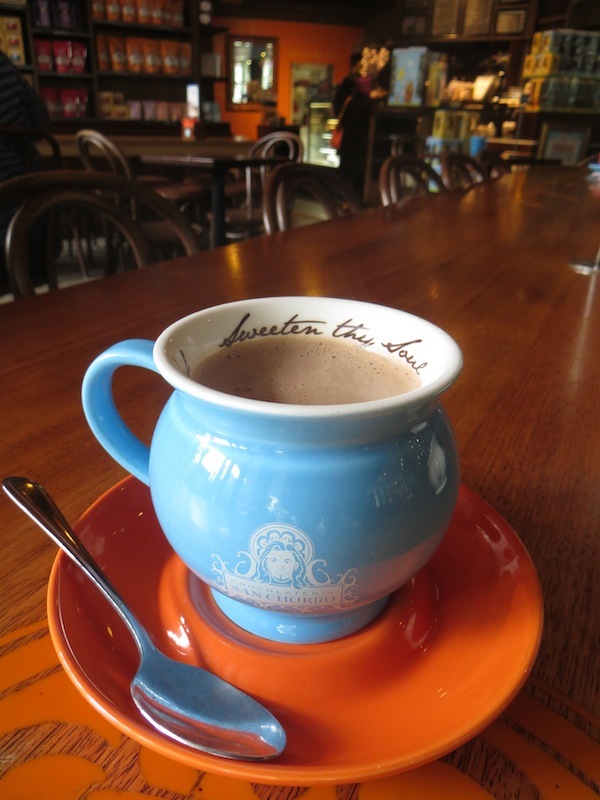 It was a beautiful little city and Urban Pantry is definitely a fantastic spot with a very popular hot chocolate. 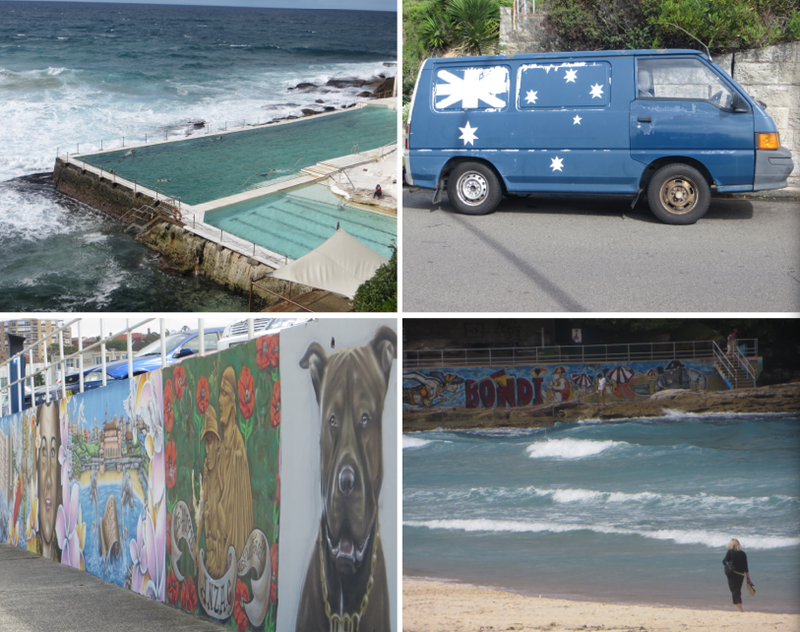 Just around the corner and up the street from Bondi beach you will find Jo & Willy’s. It is hard to miss really. It is the spot that almost always has a long line of people waiting outside for a table. This is where the locals hang out, and for 3 days we too were locals and this is where we spent most of our down time. 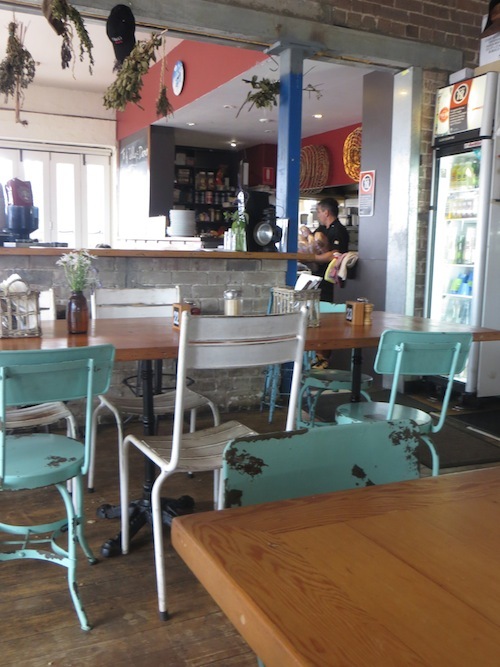 There are lots of things I loved about Jo & Willy’s. Inside it is so welcoming and fun with wildflowers on the tables. The walls, furniture and decorations are every shade of blue, all reflecting the nearby ocean which you can see if you sit at the tables outside or near one of the windows. The staff were fantastic, they all seemed like they were part of one big happy family and it seemed that the mangers, or owners were hanging around a lot of the time, greeting the locals by name and giving smiles all around. 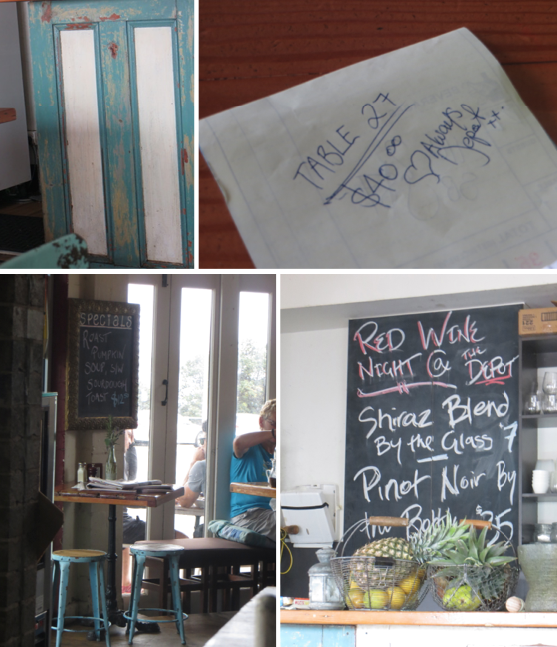 The first time we stopped by was after a stunning walk from Bondi beach to Bronte beach and back along the coast (highly recommended). We sat inside and ordered from their full day breakfast menu. My favourite was green eggs and ham . Rich ordered the Spanish breakfast. Both were amazingingly delicious. And yes the hot chocolate was very nice. I kept forgetting to order it in a mug, so I kept getting little glasses of hot chocolate, but it was nice and easy to drink. Australians are lucky, well we are all lucky, that Australia has such stunning wine regions. Of these, Rutherglen is a small one, but a good one. 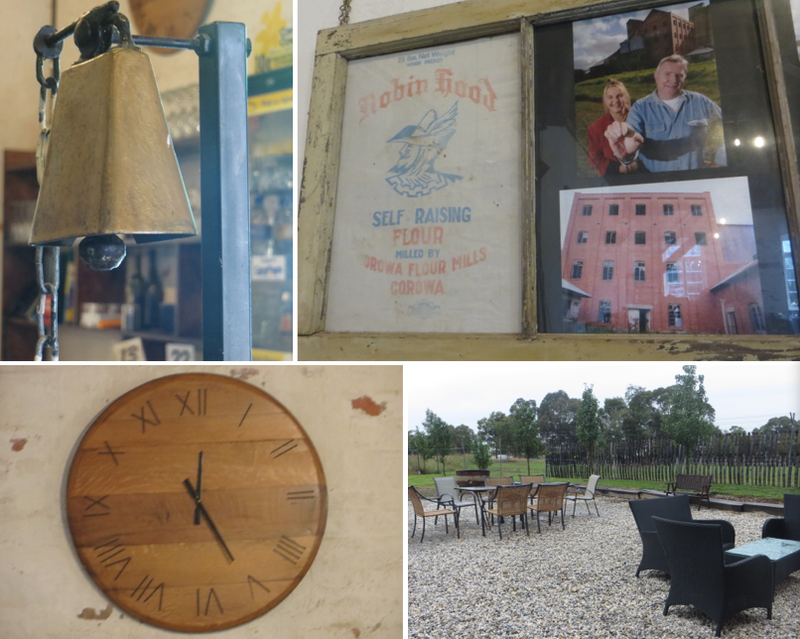 One of the great things about the wine regions in Australia is that they always seem to support a whole range of fantastic business that have nothing to do with wine, but which give you a break between multiple tastings. 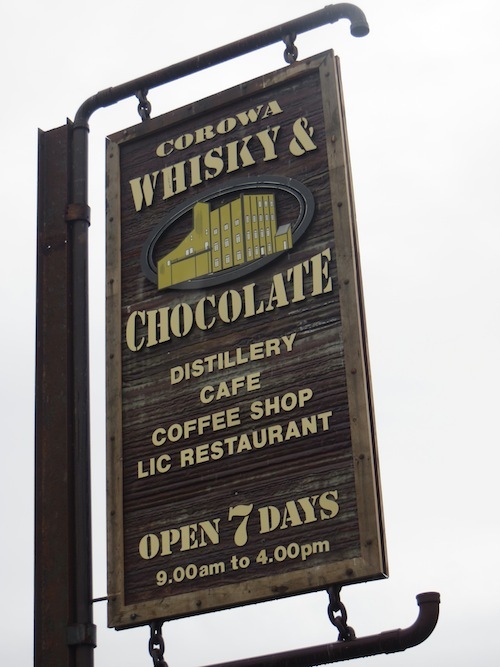 Corowa Whisky and Chocolate is one of these places, a unique place really since I have yet to hear of another spot that specializes in Whisky and Chocolate, especially one which is situated inside an old flour mill. This place has a great story. 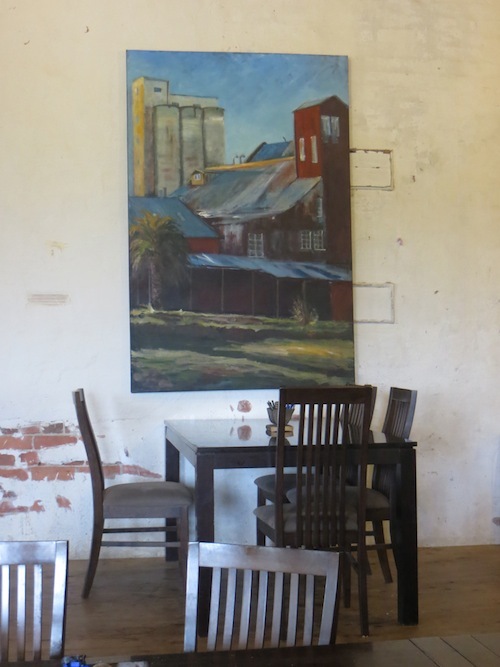 The old flour mill that it’s in was sold to the current owners by the city of Corowa for one dollar. 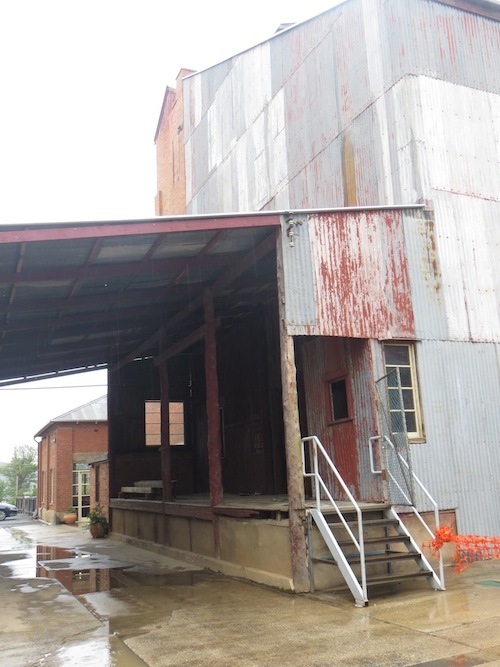 The condition was that it needed to be protected as it was a historic building. 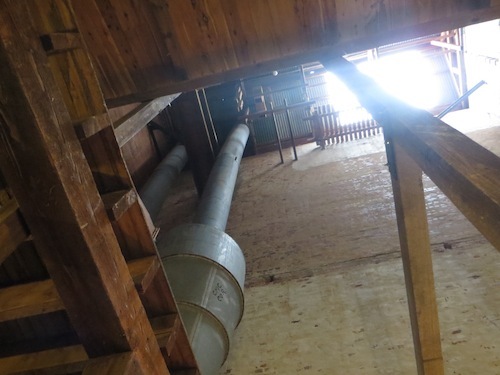 So in 2009 the owners started renovating this mill which had been abandoned since 1970. At the moment a small part of the building is being used to make and sell a whole range of chocolates made using organic Belgian chocolate. There is even a small room where children can create their own chocolates covered in multi-coloured spinkles (the Aussies call these Freckles). 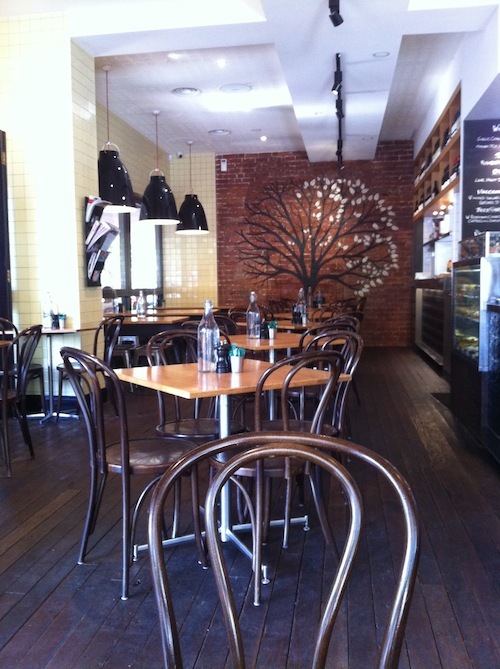 They have a very large café which serves food and, as would be expected, a hot chocolate. 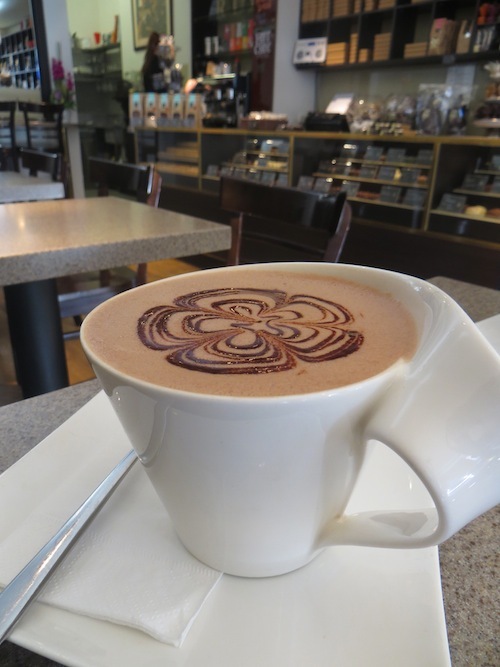 The hot chocolate was made using their own blended chocolates, and was presented in a tall glass with a very large spoon. 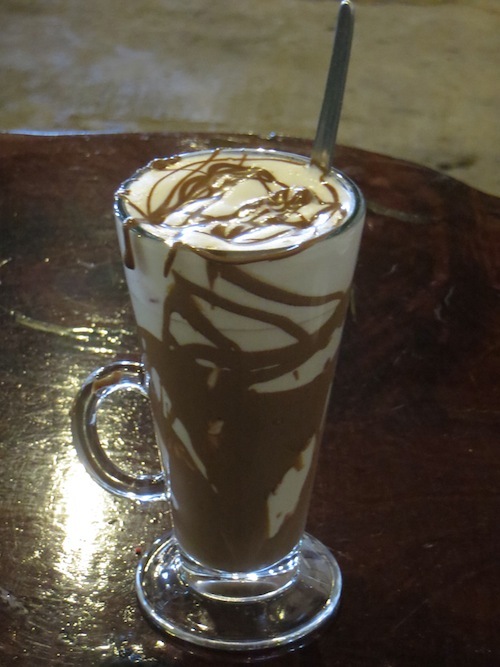 They lined the sides of the glass with chocolate and then fill it with hot milk. I found it a little sweet but a lot of fun. After the hot chocolate we were hoping to move onto the Whisky but we will have to wait a bit longer unfortunately. 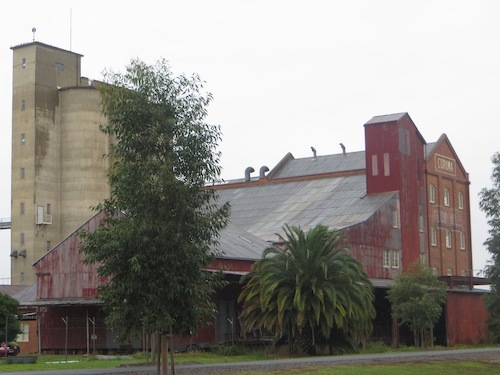 They are still working on creating Australia’s first organic whisky, and once set up, will be serving and selling a very wide range of local and imported whiskies so stay tunned for more. They also plan to have Whisky and chocolate tours and on the weekends already have live music from 11am to 3pm. 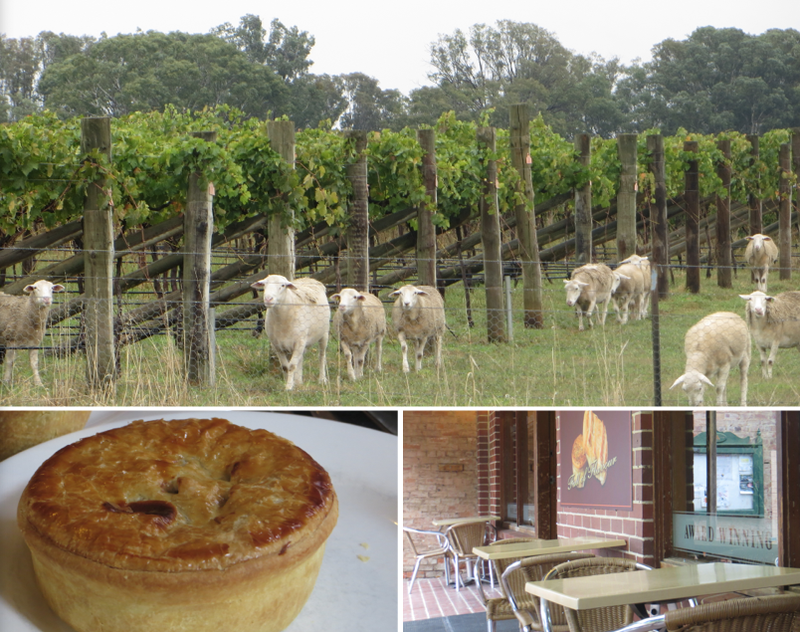 We followed our hot chocolate stop with some award winning pies from nearby Parker Pies in Rutherglen and a visit to a few vineyards, which made for a pretty good day if you ask me! It was raining again this morning. 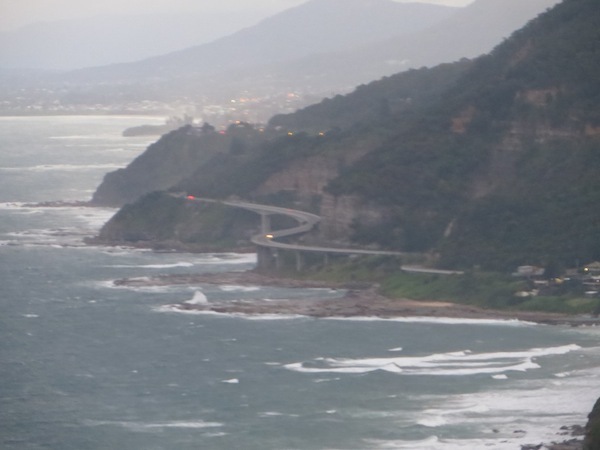 It hasn’t stopped raining since we arrived in Australia a week ago. Apparently they haven’t had much rain at all around here either, that is, until we arrived. Perhaps we should get a thank you letter from the people of Australia. We brought the rain ….. 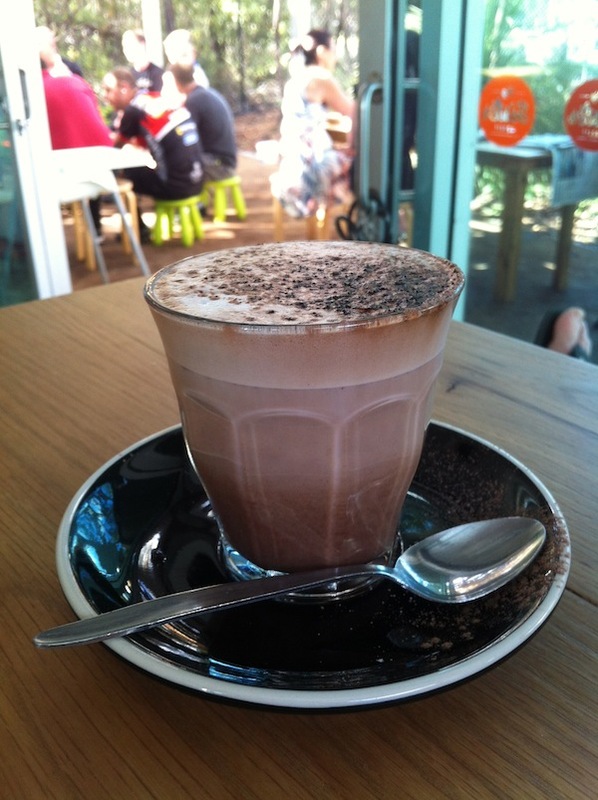 In return, Australia has given me some nice hot chocolates to warm me up after being damp constantly. 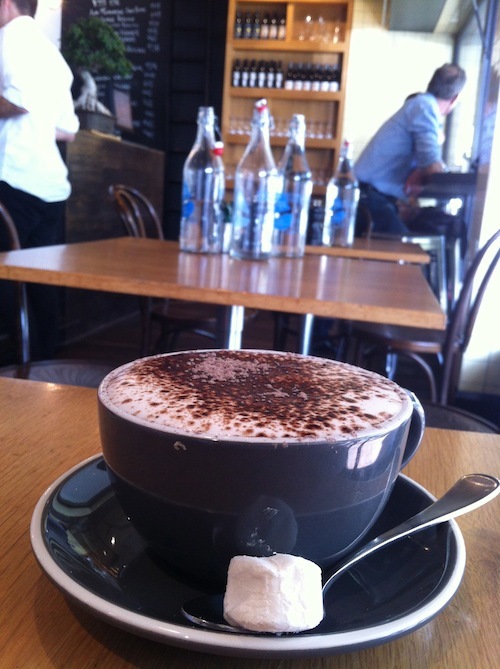 This morning’s hot chocolate was found in the beautiful town of Tilba. 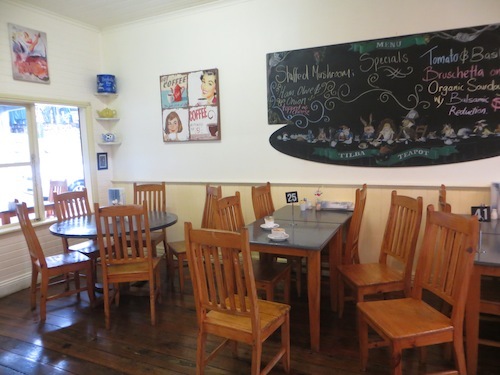 Tilba is a little bit like a dream, the kind of town you see in movies but don’t imagine actually exsists. To get to Tilba you take a windy road up and down over gorgeous rolling hills and rocky cliffs, past fields of happy looking sheep and cows. 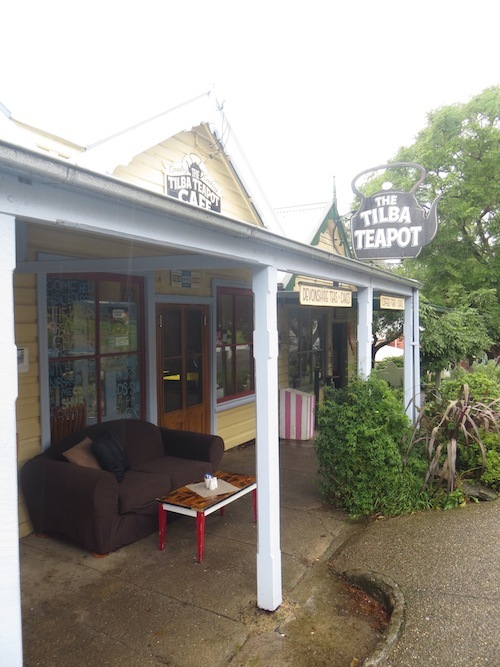 Central Tilba has a population of 80 and Tilba Tilba (right next door) a population of 30. All this is in the shadow of Mount Dromedary (806m), considered sacred by the indigenous Yuin tribe that originally inhabited the area and then named by Captain Cook because he thought it looked like a camel. 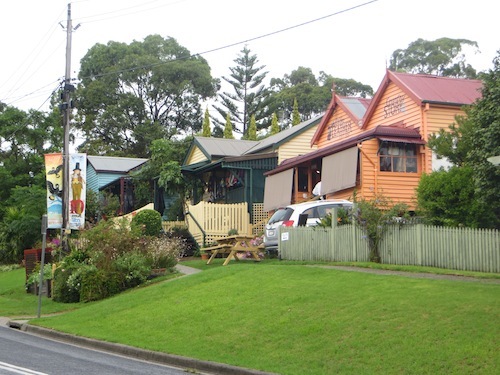 The little village of Central Tilba has a historic character which has been preserved and the National Trust classified the entire township in 1974. 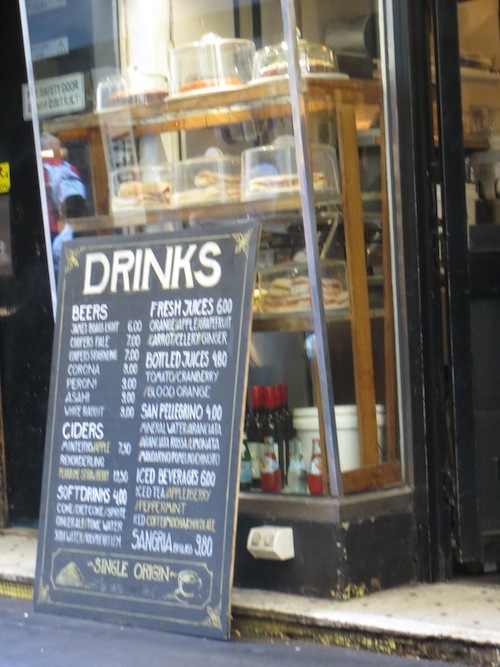 As you walk through the streets you will discover a two cheese shops, jewelers, leather craftsmen, and of course a healthy selection of cafes to host the constant stream of tourists. Even in the rain we managed to walk by all the cafes before choosing one. I was in the mood for a good hot chocolate so we took the time to pick the café where we thought we would have the best chance. 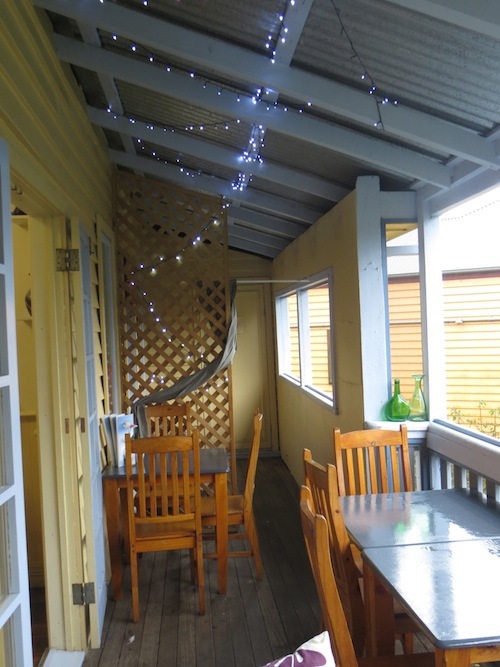 We chose Tilba Teapot because it was incredible cute and had a gorgeous balcony with a nice comfy sofa. 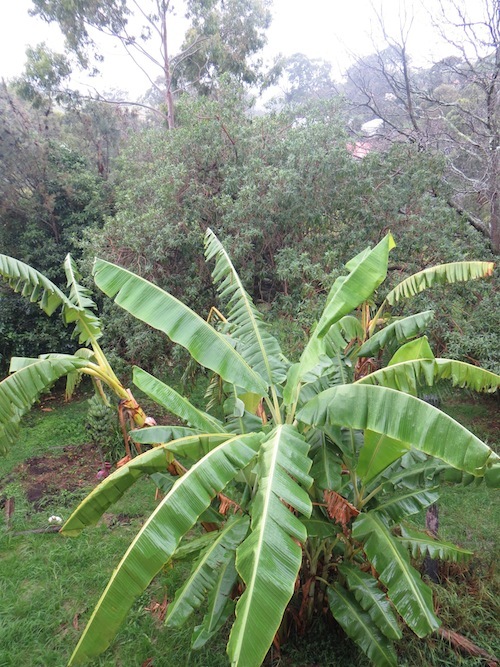 From here we had a stunning view of lush green gardens. Rich even went in ahead of time to ask what kind of hot chocolate they had. “Cadbury” the man in charge of hot chocolates here said “ but I make it really well”. I have never been a fan of Cadbury hot chocolate as those of you who read my blog regularly will have no doubt noticed. 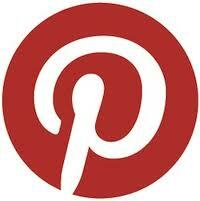 It is incredibly popular, but I find it too sweet. That is, until today. I now realise that maybe it had never been prepared properly. The man was so proud of his creation and rightly so. I don’t know what he did. Maybe the milk was better, or perhaps the amount of powder he used, or maybe it was the rain! Either way, it was a very enjoyable hot chocolate. On the drive along the coast from Melbourne to Sydney, as you get close to Sydney you may start seeing signs for Helensburgh on the side of the road and will probably not even think twice about stopping. I’d think again. Not only are the views along the coast from here absolutely stunning but there is another yummier reason to stop; Big Sister Horsie. Come again? Yes, Big Sister Horsie is a hidden gem and when I say hidden I mean hidden. 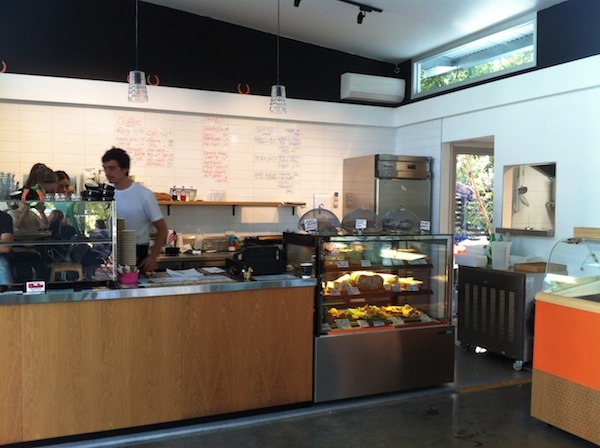 The café is a small aluminum building surrounded by gorgeous gum trees with spots to sit both inside and outside. 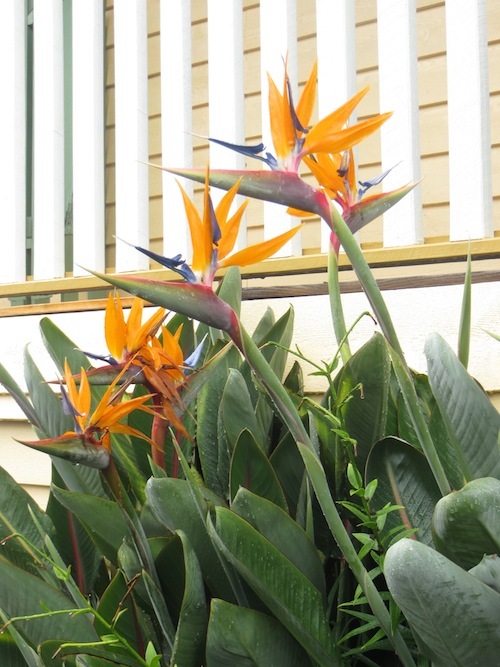 It is tucked on a side road in a light industrial area. 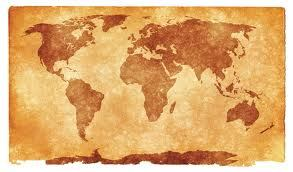 It is amazing that anyone can find it, but in fact everyone has found it. This was the place to be this morning in Helensburgh and I suspect every morning, afternoon and evening (and now that they are open on Sundays as too). 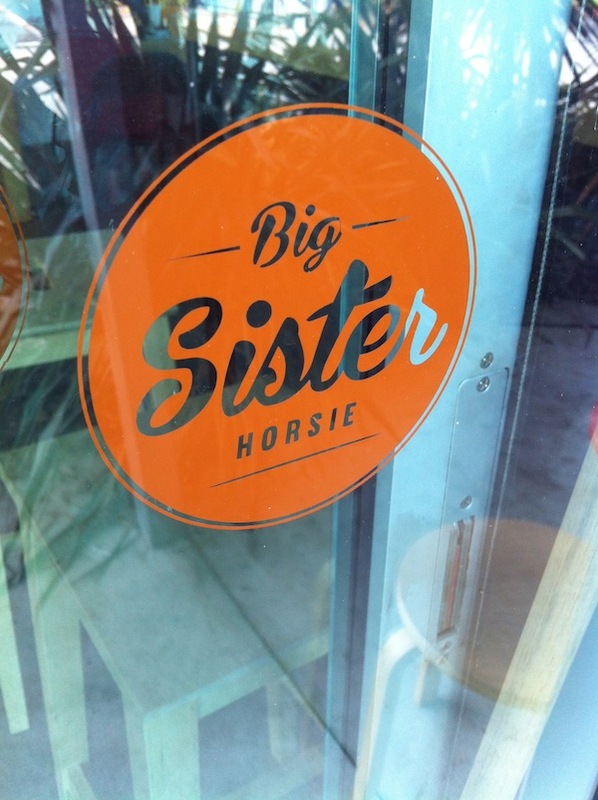 When I first heard that the name of this tiny café was Big Sister Horsie I stopped and mulled it over. It makes no sense the first 10 times you say it. And then all of a sudden it becomes catchy and sinks in. There is of course a story behind this name. 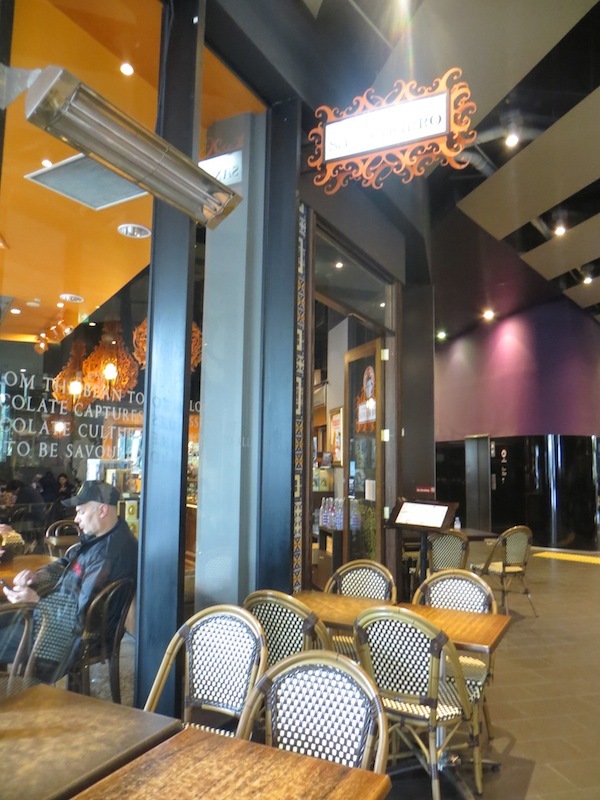 The owner, a young Italian man, let his young daughter Luna choose the name of the café. She suggested Big Sister Horsie. 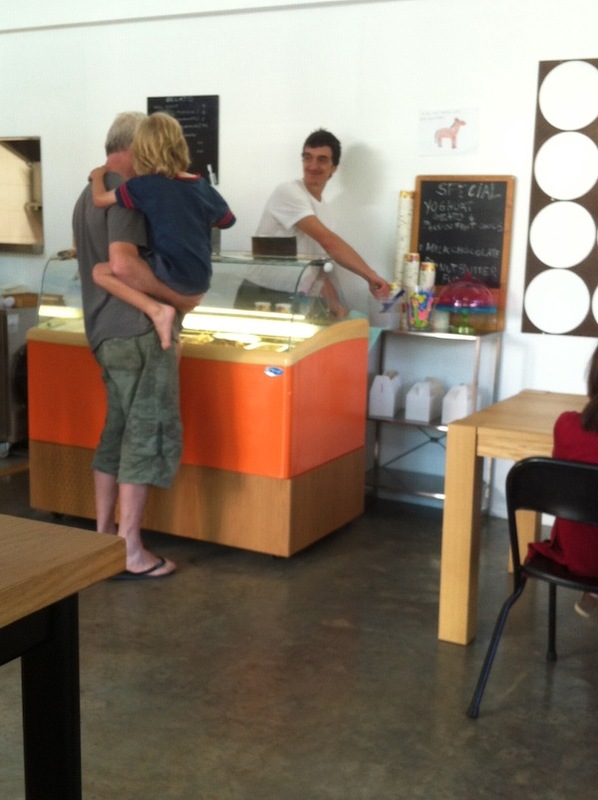 Luna was in the store today, helping her father out (in spirit) and eating gelato. And she wasn’t the only one, every kid from the neighborhood was here this morning, and most of them were eating the ridiculously good freshly made gelato. The parents were all enjoying the delicious breakfasts offered here. 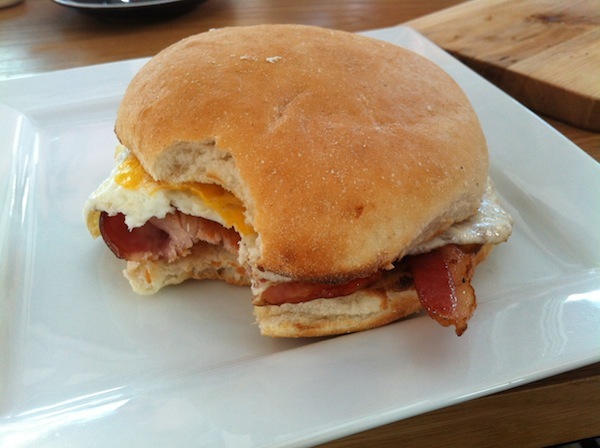 The bacon and egg sandwich….hmmm…my mouth is watering just thinking about it. 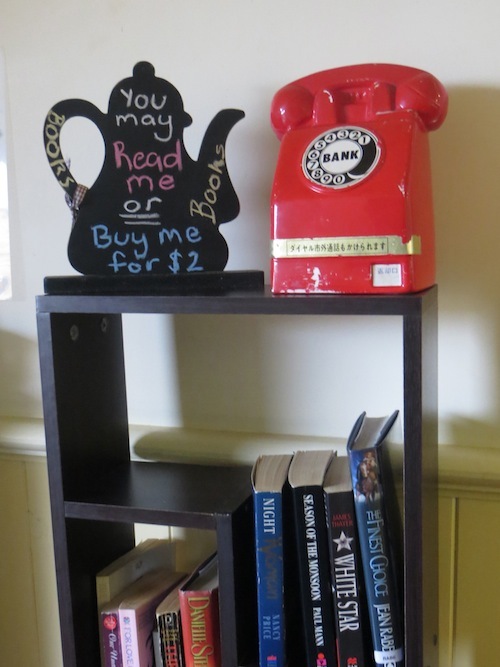 The service was slow, but really who was in a rush anyway – it was all worth the wait. My hot chocolate was beautifully presented in a small glass on a black saucer sprinkled with chocolate powder. It tasted a lot less chocolatey than it looked, it was more of a large warm glass of hot milk with a very slight tinge of chocolate. But I enjoyed it and would have it again. In 1500, Hernan Cortes, a great Spanish explorer driven by a pioneering penchant and a lust for wealth and power, arrived in Mexico. There he was mistaken by the local inhabitants to be the descendant of the Quetzalcoatle, the patron god of cocoa crops. To honour the deity, the Aztec Emperor offered the weary Cortes a golden goblet of xocolatl – a bitter, thick drink made from ground cocoa beans and infused with spices and chili. Cortes returned to Spain and took with him a ship full of cocoa beans and the secret receipt for preparing this cocoa drink of the Azetecs. The Spanish court fell so in love with the drink (not surprisingly) that the King decreed it be only for the enjoyment of the nobility. Spanish monks were entrusted with the secret and sweetened the recipe to better suit the Spanish tastes. 100 years later the Queen of Spain fell ill and everyone thought she was about to die. One of the monks caring for her brought her a drink of hot chocolate and mysteriously she was reinvigorated and brought back to life. The monk declared chocolate to be a gift from God. The monk’s name was San Churro. 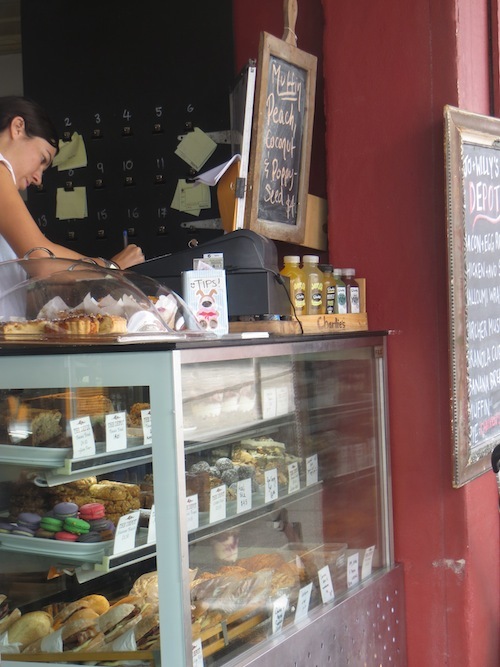 Owners Kelly and Giro got the idea of Chocolateria San Churro while sitting eating churros and sipping hot chocolate in Madrid. 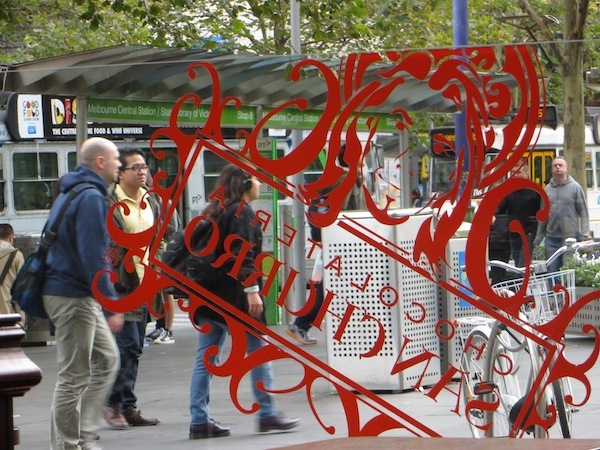 When they returned home to Melbourne they opened the first Chocolateria San Churro on Brunswick Street, Fitzroy in March 2006 where I have been many times. 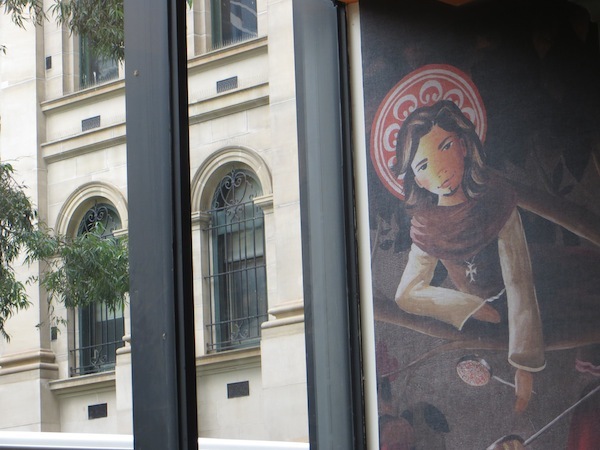 There are now over 38 stores across Australia, and today we tested out out their location in the CBD right next to the State Library. The table where we sat had the quote “Forget love I’d rather fall in chocolate” painted along the top. Ah, to fall in hot chocolate (not too hot though). Sounds like a beautiful spa experience. But today I was more in the mood to drink one, if only I could make my choice. Chocolateria San Churro is really all about hot chocolate and there are dozens of them to choose from. 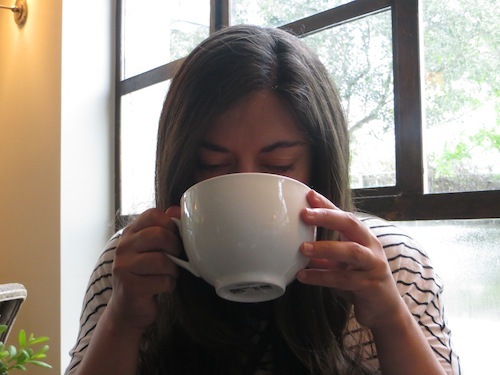 I had a thick, unsweetened Spanish hot chocolate, but could have chosen a Mexican Azteca hot chocolate flavored with chili and cinnamon, a dark coverture hot chocolate, a dulce de leche hot chocolate, maybe even accompanied by a plate of freshly made churros. I enjoyed my hot chocolate. 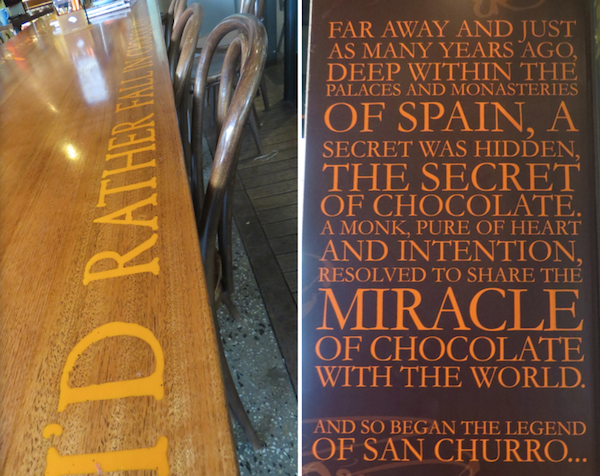 It wasn’t as thick as the original Spanish hot chocolate that I imagine the owners had first tasted in Spain, but it was easy to drink while still being decadent. 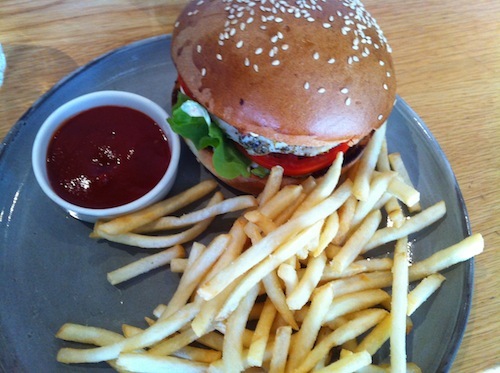 Good way to get some energy to spend the day walking around the beautiful Melbourne CBD. Last week I found a little brochure in a drawer at my in-law’s house in Melbourne, that I’d left behind after our last visit. 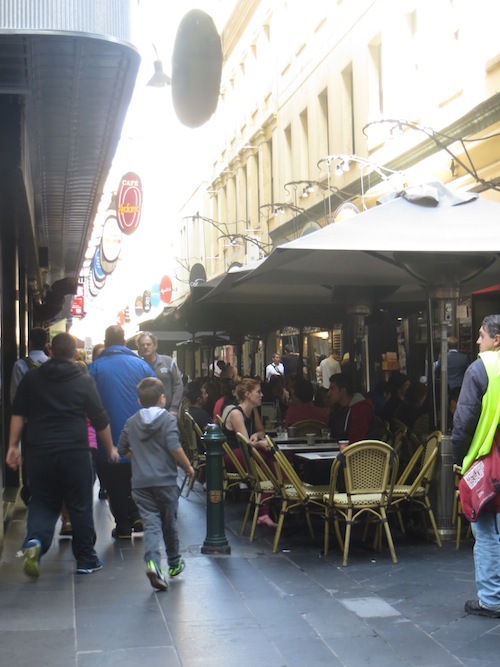 It was produced by the City of Melbourne and was a 1.5 hour, 2.5 kilometer self guided tour of the laneways and arcades of the central business district (CBD) of Melbourne. Melbourne’s little laneways began life in the 1800’s as rear access to properties facing big streets, but many were later roofed as ‘arcades’ to provide refuge from the weather and crowds. Today many have been reborn and lined with interesting shops and cafes. 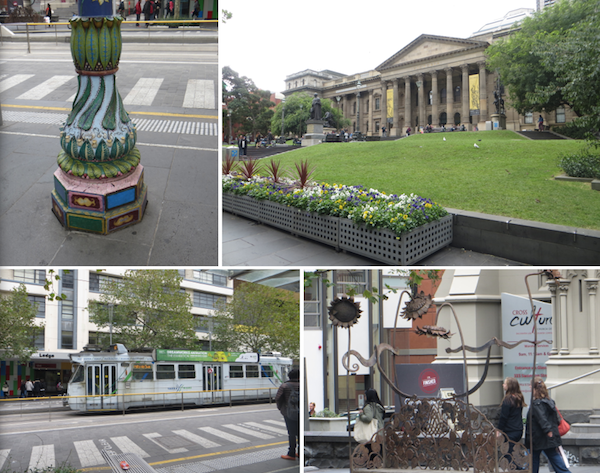 We hopped on the train to the city from Clifton Hill, and started our little tour at Federation Square. First up we passed the stunning Flinders Street Station, and headed across the street to our first laneway, Degraves Street where William Degraves’ steam flourmill used to pump away in 1850. This was as far as we got before our first hot chocolate stop of the day at Degraves Espresso. 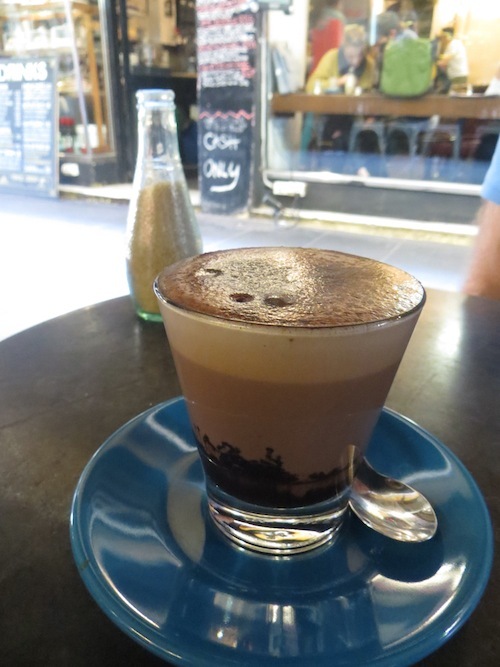 The laneways are famous for having some of the best espressos you can find almost anywhere, and this is considered one of the must tries. Rich would agree wholeheartedly. He sipped his espresso with eyes closed and a smile on his face. We sat outside under a row of dark umbrellas at a series of old metal tables, apparently recycled cinema seats and benches from a former magistrates court. There was a constant buzz of people talking around us, the place was busy, but you could still hear a street musician somewhere close by playing the guitar. Of course, I had no interest in espresso at all, so ordered a hot chocolate. It came in a glass on top of a bright, aqua blue saucer, was smooth, chocolately and very easy to drink. 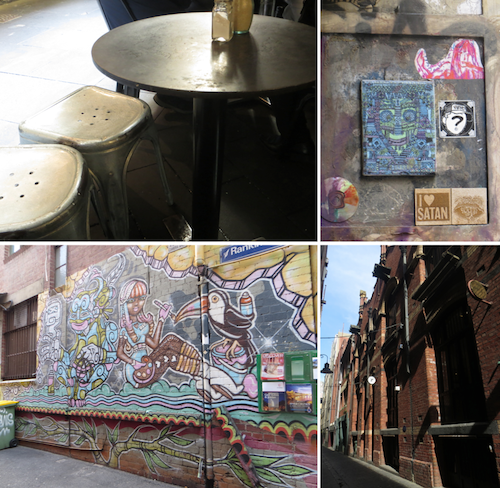 Given my low expectations of hot chocolates from Rich’s favourite espresso bars, it was a surprisingly perfect beginning to a great little discovery walk around the laneways of the CBD. Verdict: The hot chocolate was surprisingly nice and the service was incredibly quick too! 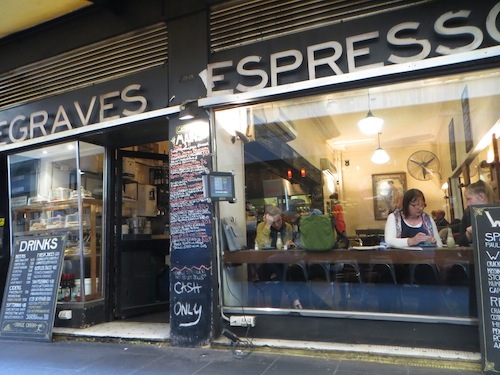 Degraves Espresso, Degraves Street, Melbourne, Australia.